Ever since I made the decision to continually minimize my closet and become more selective about what I purchase, I’ve naturally had to give some thought into what that would look like and require. One such realization has been the need to do my best in choosing only pieces that I will get a lot of wear out of, ones that will still be interesting to me season after season. Looking at my wardrobe, the clothes with the most longevity are always neutrals in classic shapes made interesting with textures and details… which is why this frayed linen jacket and lace skirt made it into the closet (and have been on serious rotation) this summer. ps. 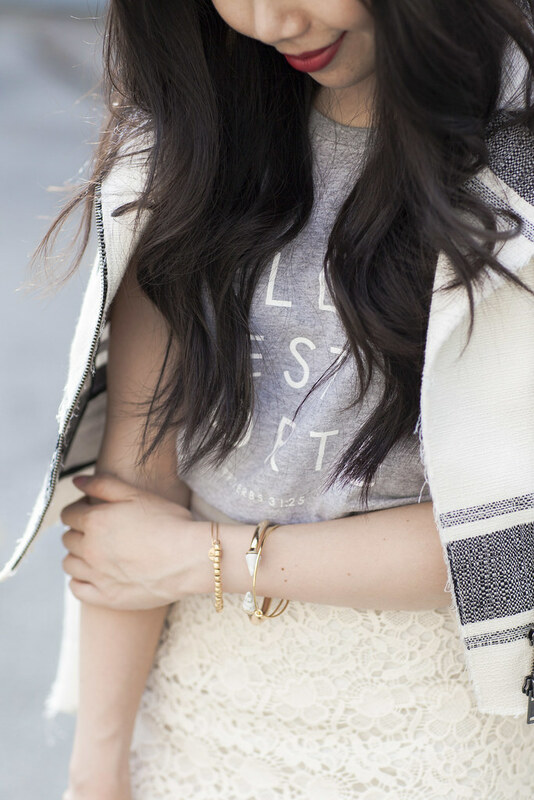 The lace skirt is on super sale now, see how I styled it multiple ways here, here and here! This is super pretty, Jen! I love the casual tee mixed in with these ladylike pieces! xo! im really loving the skirt! Love this combination. The light shades are just perfect for warmer weather. Gorgeous look and super feminine! I love the added casual touch with the graphic tee. These pieces are definitely classic ones for years to come. This is STUNNING! I’m also huge on texture (the right texture can make a fabric look a lot more expensive than it is) and that jacket is perfectly frayed. Lovely outfit, your skirt is so pretty!